BUFFALO, N.Y., Aug. 15, 2016 -- Northrop Grumman Corporation (NYSE:NOC) recently announced the winners of its ninth annual Engineering Scholars program in the Western New York community. The program will provide college scholarships this fall to two graduating high school seniors interested in studying engineering, computer science, physics or mathematics. 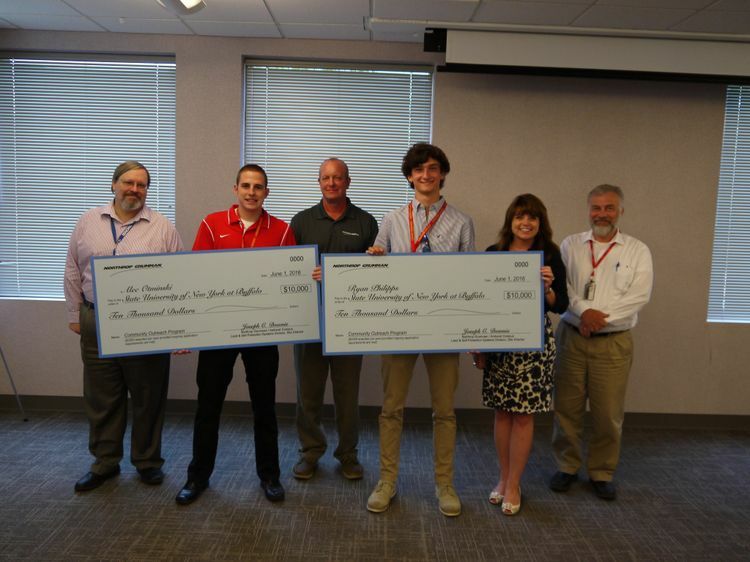 Northrop Grumman recently announced the winners of its ninth annual Engineering Scholars program in the Western New York community. Each year, the award is given to promising high school seniors in Erie and Niagara counties interested in pursuing a career in engineering, computer science, physics or mathematics. The recipients of the $10,000 scholarships were honored at a ceremony held at the Northrop Grumman facility located in Williamsville in June. Pictured are (from left) Harold Screven, product architect manager, Northrop Grumman; Alec Otminski, scholarship recipient; Bob Britton, manager, systems engineering, Northrop Grumman; Ryan Philipps, scholarship recipient; Sue Nowicki, director, engineering, Northrop Grumman; and Michael Clark, manager, Northrop Grumman. Ryan T. Philipps of Williamsville South High School and Alec D. Otminski of Niagara-Wheatfield High School each received a merit-based scholarship for their excellent academic achievements and community involvement. The $10,000 scholarships are payable in $2,500 annual installments over four years. "This program has been designed to encourage students to pursue careers in engineering, computer science, mathematics or physics," said Joseph Downie, site director, Amherst Systems business unit, Northrop Grumman. "We are proud to support these bright and motivated young students in their future careers goals." Philipps is an All-WNY Scholar Athlete and Buffalo News Scholar Athlete for football and also plays varsity baseball. He is a member of the American Field Studies Club and in his free time he volunteers at the Amberleigh senior assisted living facility in Williamsville. He will be attending the State University of New York at Buffalo studying mechanical engineering. Otminski has been an active volunteer with the Leukemia & Lymphoma Society for the past three years and also spends his time tutoring other high school students. He is a student-athlete who has served as captain of his track and varsity volleyball teams. He will study computer science at the State University of New York at Buffalo. The Northrop Grumman Engineering Scholars program aims to support promising high school seniors intending to pursue a career in an engineering-related field. 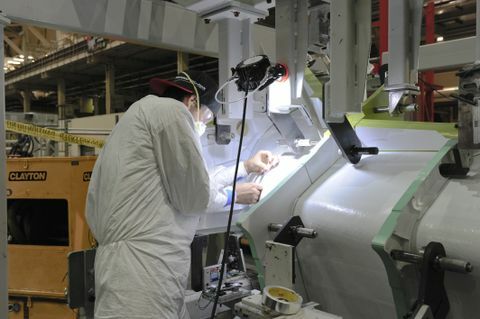 Candidates must plan to attend an accredited college or university school of engineering as a full-time student in an approved engineering program. The funds can be used for tuition, books, room and board, and lab fees. A committee of Northrop Grumman employees selected the Engineering Scholars winners. To be eligible, each scholarship applicant had to be a resident of Erie or Niagara County and be a graduating senior this spring from a public or accredited private high school in the state. Applicants also had to have a minimum composite SAT score of 1,700 or ACT score of 27 and a minimum GPA of 3.5. The committee also took into consideration work experience, community involvement and extracurricular activities. 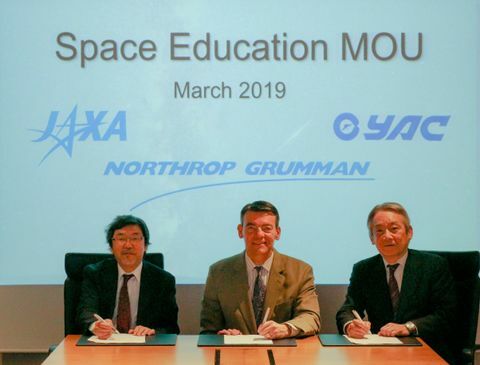 Northrop Grumman is a significant financial and in-kind contributor to educational outreach programs aimed at encouraging young people to consider engineering and science-related career fields. The company supports multiple projects and programs to excite students' interests in science, technology, engineering and mathematics (STEM).